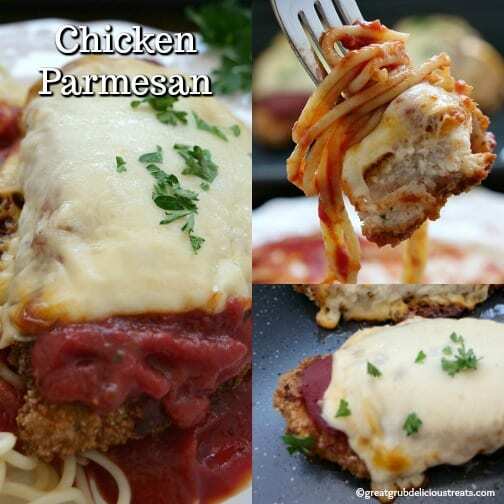 Homemade Chicken Parmesan is easy to make at home and is a delicious favorite dinner recipe that the whole family loves. 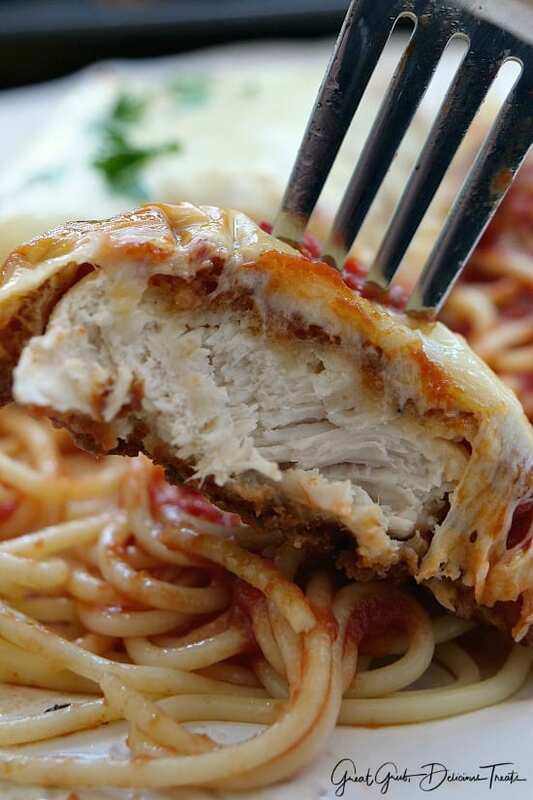 Chicken Parmesan is one to our favorites when eating out and to be able to make this delicious dinner at home is all the better. 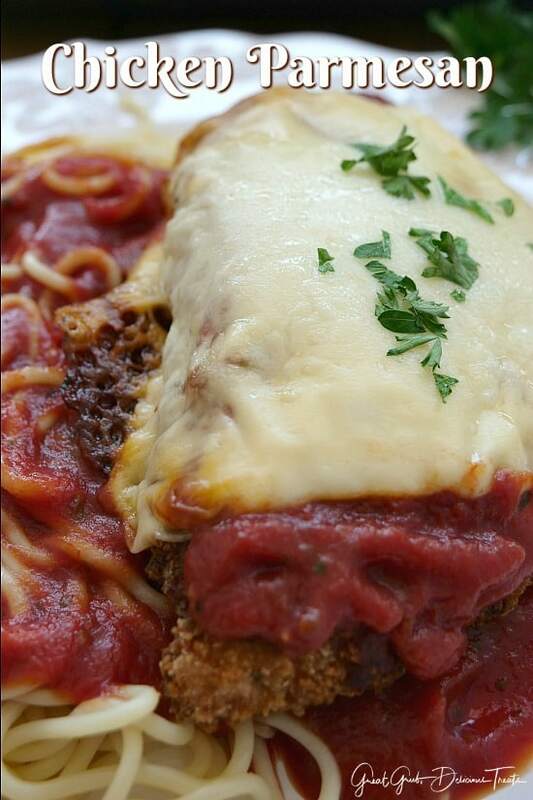 Crispy chicken breasts topped with homemade spaghetti sauce and melted mozzarella cheese… YUM! Then, placed on a bed of spaghetti with even more delicious sauce. Talk about delicious! 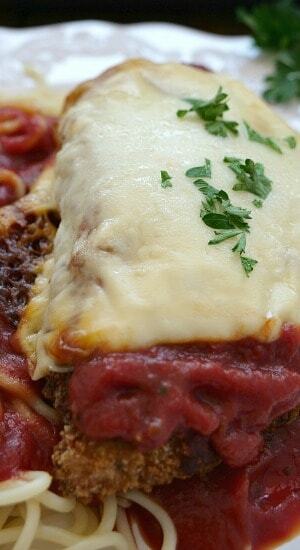 Seriously, this homemade chicken parmesan recipe is perfect for an easy weeknight meal. Plus, who doesn’t love meals that are homemade from scratch? Our whole family enjoys this chicken recipe and even the leftovers tastes great the next day, if there’s any left. I also made Chicken Parmesan Bites which I’ll post on the blog soon. Those are super tasty as well and make for a great little appetizer which everyone raves over and are perfect for parties, family gatherings and potlucks. 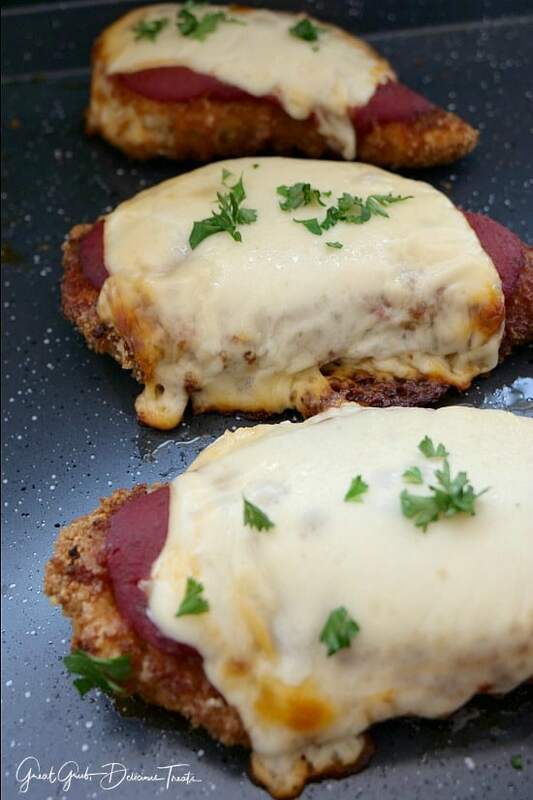 Crispy Chicken Breasts are always a hit at our house and then topped with mozzarella cheese and homemade sauce, super yummy! 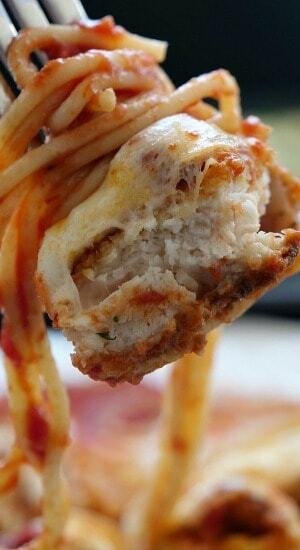 So the next time you are trying to figure out what to make with chicken, remember this easy Chicken Parmesan recipe. Super simple and super delish! 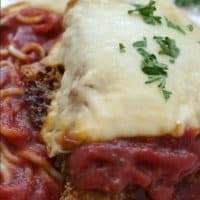 Here are a few more chicken recipes you can find on the blog that are super delicious and are family favorite recipes: Crock Pot Cheesy Chicken Red Beans and Rice, Parmesan Crusted Lemon Chicken Strips, Spicy Chicken Pasta and Gravy, Chicken Cordon Bleu Grilled Cheese, and one of my kids all time favorite chicken recipes, plus many more. Preheat oven to 350° when chicken is almost done frying. Heat oil over medium heat in a cast iron skillet. In a large baggie, add flour, seasoning, garlic salt and pepper. Shake to combine. In a bowl large enough to fit a chicken breast, add whisked eggs and in another bowl/container combine bread crumbs with Parmesan cheese. Mix together. Set aside. Start our by adding two pieces of chicken to large baggie with the flour mixture, seal and shake to coat. Remove chicken breasts and place one at a time in the egg mixture, coat both sides and then transfer into the bread crumb mixture. Place coated chicken breasts into hot oil and cook for about 6 minutes on each side. Remove chicken from skillet and place on plate lined with paper towels until the remaining chicken has finished cooking. Once the chicken has been fried, place chicken breasts on a baking sheet. 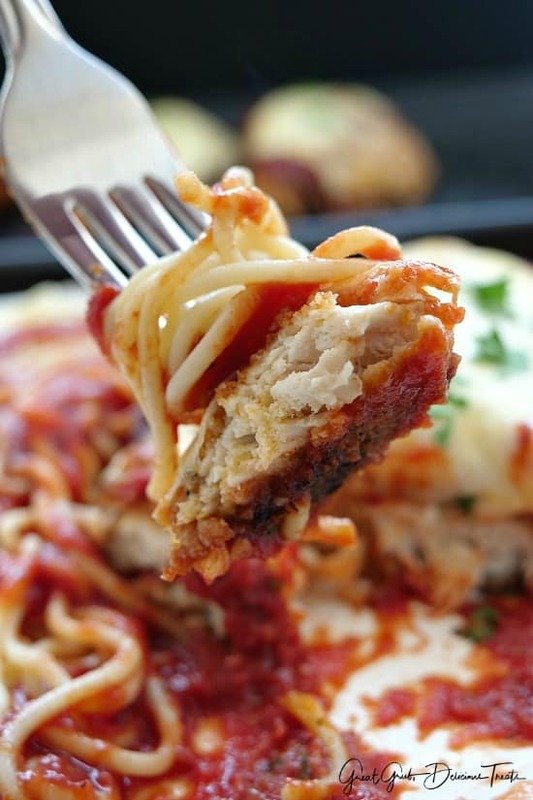 Top each piece of chicken with spaghetti sauce and a slice of mozzarella cheese. Place in the oven on 350° for 20-25 minutes, depending on the size of the chicken breasts. Remove chicken from oven. 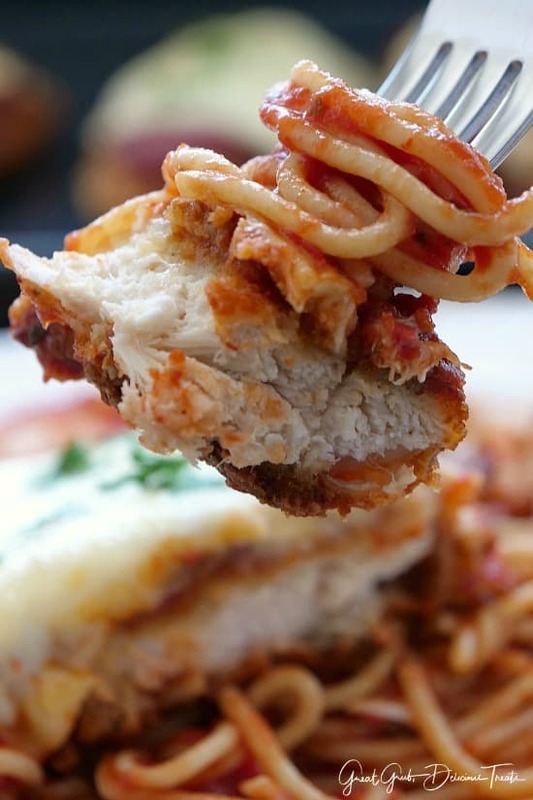 Add pasta to plate, top with additional spaghetti sauce and place chicken on top of spaghetti noodles. Enjoy!